Coimbra University. Law school entrance and bell tower. After breakfast, we boarded the bus that will take us to Porto to board our ship for the river cruise on the Douro. Along the way we stopped in Coimbra for lunch, and then stopped at the University of Coimbra for a tour of the chapel and the old library. 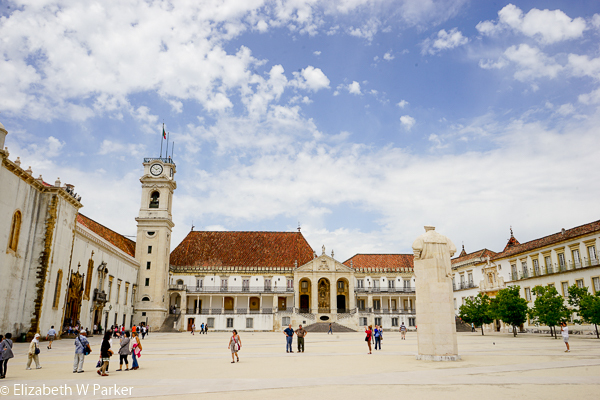 This complex of buildings was once a royal palace, Coimbra having been the capital of Portugal for a time in the distant past. 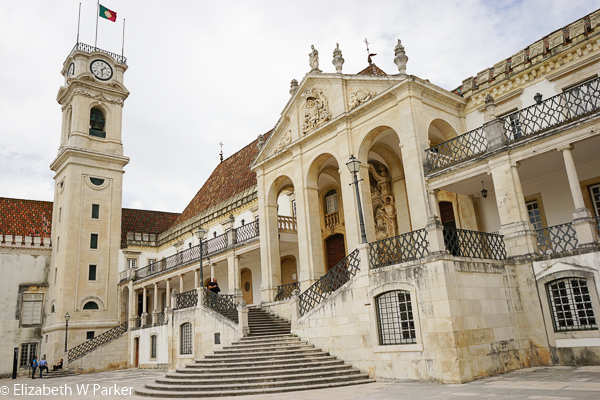 The complex was abandoned by the royal family when the capitol moved, and was given to the city for the founding of what is the oldest university (1290) in Portugal and one of the oldest in Europe. We visited the chapel first. This is a beautiful space, and was the place where the royal family and the nuns had their own separate balconies for participating in masses, apart from the commoners who would have been on the ground floor. A massive organ dominates one side of the small chapel. The decoration is basically Manueline. The library is said to be one of the, if not the, most beautiful libraries in the world. It is spectacular. Three rooms, with floor to ceiling stacks of old, leather-bound tomes. Built between 1717 and 1728, the library received its first books in 1750. Most of the books displayed are from the 16th – 18th centuries. They can be consulted, with a fairly rigorous protocol, but most have also been micro-filmed and can be accessed by anyone in that format. The library is a perfect mini-ecosystem, having been built so as to maintain a constant temperature and humidity. The introduction of tourist visitors threatens this ecosystem, so groups are admitted to small numbers for a limited time. Between groups, the library is closed for 10 minutes, to allow the natural temperature and humidity to return to the desired values. Believe it or not, there is also a small colony of bats living in the library. These little creatures eat insects that get in. To control the damage the bats might do, every evening the surfaces in the library are covered and in the morning the library is cleaned. Another Trivia-worthy fact – the oak used to build the stacks has a natural insect repellent, providing the books with additional protection from insects that eat paper. Our cruise is under the Uniworld brand, and our ship is the Queen Isabel. Our cabin has a small balcony, and is really very comfortable. Though not the largest on the ship, our cabin is one of the larger ones, and I am thankful for the extra room and beautiful views through our two large windows (one goes out to the balcony). The ship is very tastefully decorated, and it has both a little swimming pool and a little fitness room! Still docked in Gaia (across the river from Porto) our ship will sail later this afternoon. Boats cannot sail during the dark on the Douro, so we were parked here all night. 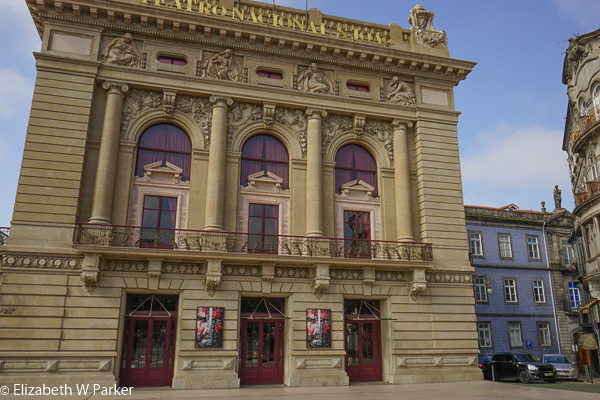 We will begin our cruise later today, but first we get to tour in Porto. 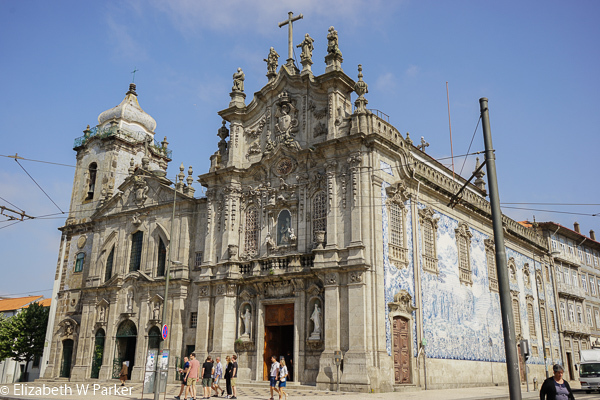 We have two options for tours of Porto, and we chose the walking tour. We were dropped off at the edge of the huge and famous Dom Luís I Bridge on the Gaia side about 9:00 am. 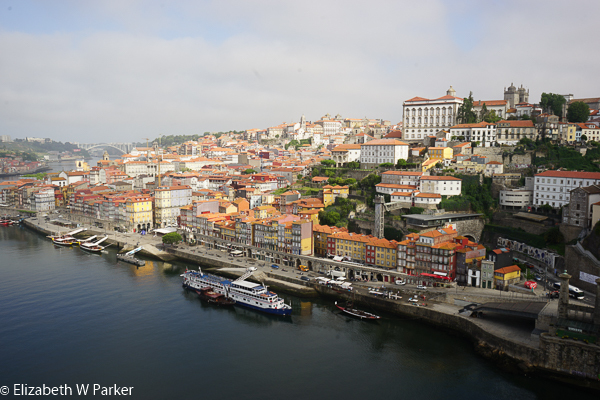 We crossed the bridge, stopping to admire the incredible views it gives of the city of Porto. Behind us, looking down the river (with our backs to the ocean) we can see the María Pía Bridge designed by Gustav Eiffel. The bridge we were on was designed by another architect in his firm. From the bridge we walked past the Santa Clara Church to the Largo dos Portas do Sol, then making a loop around the Teatro and the Largo da Batalha, down a narrow side street (Rua Cimada Vila) past little shops, time-worn and out-of-date with our modern world, places where you could get your shoes repaired or buy some thread, very specialized services whose heyday has passed. Our guide explained that in Porto, like in most of the thriving cities of the world, these little old shops are holdouts against a drive to buy and rehab whole neighborhoods for greater profit. Later in the morning, we would see the first neighborhood that underwent that transformation, and the results are very nice. The neighborhoods retain their character: the houses are still small, just with modern windows and doors, and probably with heating and sanitation to code. But you can easily forget that people who lived in those houses for their entire lives, and certainly hoped to die peacefully there, were forced to sell and move to make it possible. Coming back around by the theater, we then returned to the Largo dos Portas do Sol to catch a tram that would take us to the Praça Gomez Teixeire (the name on the street signs and on the map, but which our guide told us is really known only by the name Praça dos Leões – Lions Square). 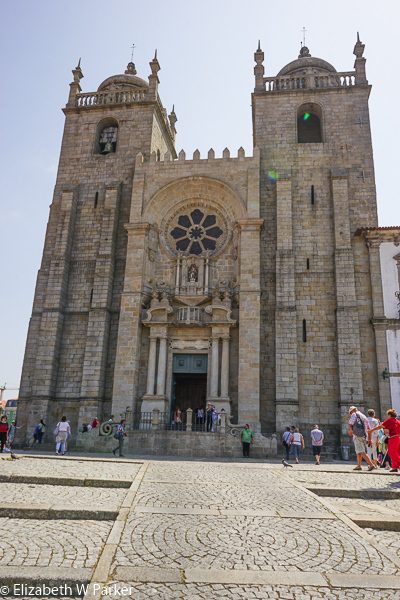 From here we could clearly see the facades of two Carmelite churches that are standing side by side, Church of the Carmelites and the Church of Carmo. They are significant because of their tiles. 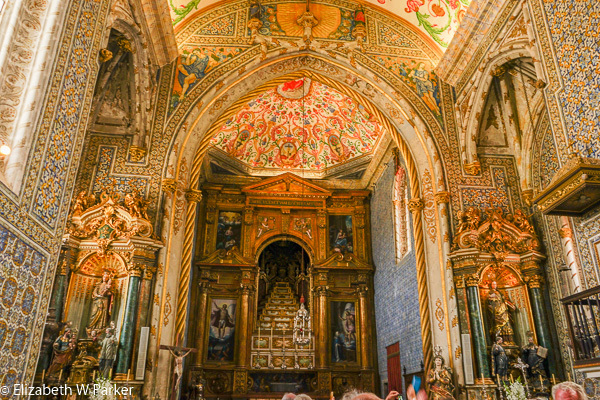 The azulejos (painted tiles) in Portugal can be seen everywhere. 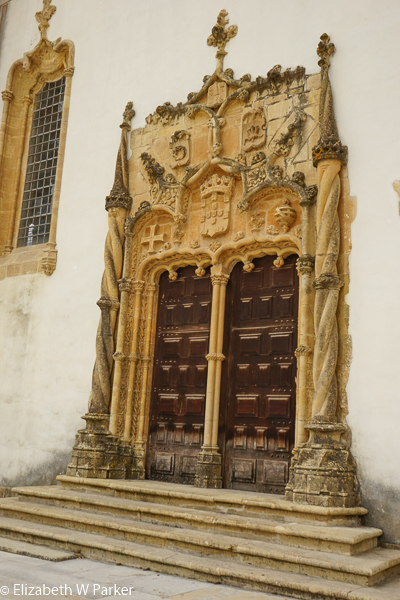 Their use dates as far back as the 13th century when the Moors came to Portugal. In fact, the word means “small polished stone” and the “azul” (Spanish for “blue”) is only coincidental with the multitude of blue tiles one sees. 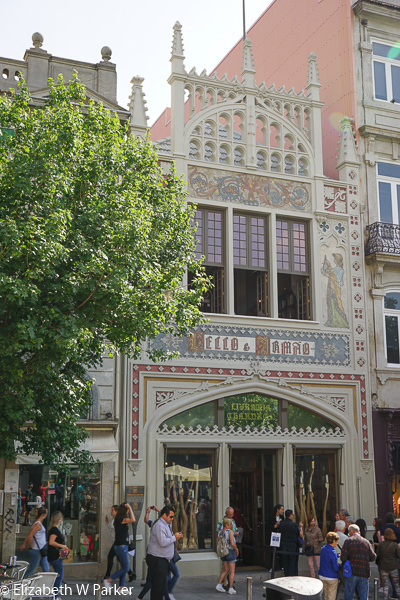 The other significant site on this plaza is the Lello & Irmão Bookstore where J.K. Rowling got her inspiration for the Harry Potter books. There were so many Harry Potter fans in the store (who weren’t buying books) that bookstore now charges admission! If you do buy a book, they will subtract the cost of admission from the price of your purchase. We did not go in, but I am planning to do so when I return to Porto next week! We had a little free time from our guided walk here, so Gerry and I did a little exploring. He was really looking for an ATM machine (an obsession of sorts) and I wanted to peruse the store fronts. We are right next to the Clérigos Tower here, so we took pictures of it, and contemplated visiting the church itself, but time was a little too short for that. Something else we could do when we return. When the tour resumed, we walked the Rua dos Clérigos to the Praça de Liberdade and the base of the Rua dos Aliados (reference to the Allies is to WWI. Portugal was neutral in WWII). That is an impressive sight! Lined on both sides with magnificent buildings and two long swathes of green trees, the Town Hall at the end is a fitting crown. The place is busy! Cars, trucks, people, buses – everyone going somewhere in a hurry! In a big hurry to get to the train station, perhaps? The São Bento Train Station is just a short hop from here. “The Most Beautiful Train Station in Portugal” is definitely an understatement. 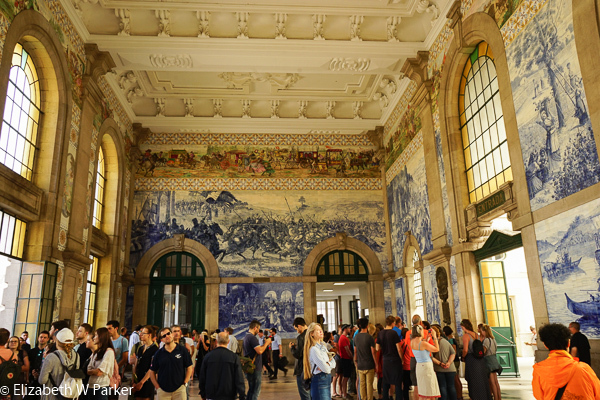 The main lobby is graced with huge azulejo murals about the history of Portugal, and another, a frieze of the history of transportation, runs all the way around the room just under the ceiling. Our guide used the phrase “Right up to the arrival of the train…” I looked around to find the train in the mural, and sure enough, it’s arriving! The other amazing thing about this lobby is something I noticed the first time I saw it, and confirmed on this visit. The light that fills this big room is tinged with magic. Our next stop was the Cathedral. 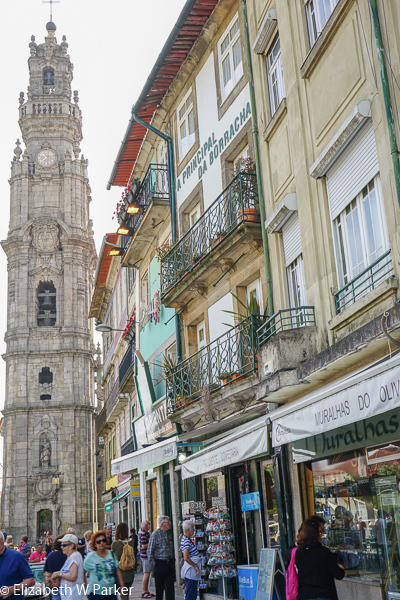 You can see it from all over Porto because it is situated on the top of a hill and is a large building with towers. That was probably always true throughout history, but what isn’t, according to our guide, is that the church had a immense open square in front of it. Apparently, the cathedral was originally surrounded by a warren of small houses and stores that were demolished to make the entrance to the cathedral grand and imposing. There is even a pillar commemorating the discoveries launched from this “port” that only dates in that location to the 1940s. From the Cathedral we walked down through narrow, winding streets that, as I mentioned before, have been rehabilitated. The street is just as bumpy but the houses have unbroken, washed doorsteps and windows, and it feels like a place where people live happily. We were treated to peach iced tea and cookies in a little shop before we wended our way through these streets to find our bus and ride back to the ship. The bus took us back over the Dom Luís I Bridge on the lower level. My first ride across the famous bridge! We had lunch on the ship, and then joined another excursion to the Amorim Cork factory. 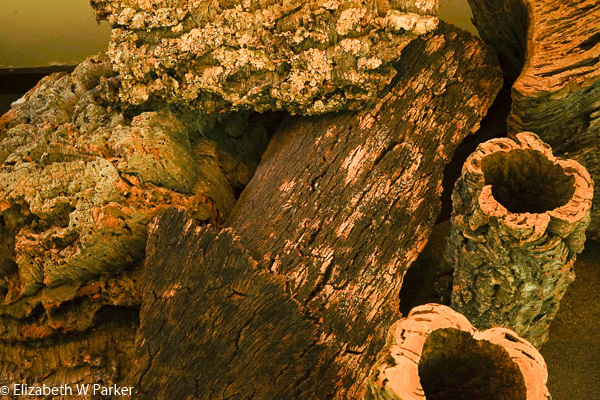 Cork bark – straight from the tree. I won’t detail the manufacturing process for you, but some highlights may interest you. Cork is harvested as big sheets of bark from the cork trees. Removing the bark without hurting the tree is a highly skilled job and very well-paid. The sheets can be as big as 6’ x 2’. The quality of the cork is not consistent throughout a single piece. Once dried and flattened, and then cut into strips, corks are punched out of the strips. There are both manual punching (by real people – that is grueling work!) and machine punching. Manual punching is used for high quality corks that go into the bottles of expensive wines. Lower quality corks are made by machine. These will go into the necks of bottles of wine that will be consumed in a fairly short time frame. All the corks also go through three electronic quality checks, including one that involves pressure. I saw the machine but it moved so fast I didn’t really get to see what the test involved. I understood finally why the guide in the factory always referred to the product they were making as “cork stoppers.” Their company also makes many other cork products, including flooring, insulation, and “fabric.” This particular factory only makes traditional cork stoppers, and in 2015 they shipped several billion! (The corks are delivered to the customers – wine makers – who then print their brand marks and other messages on the corks themselves. 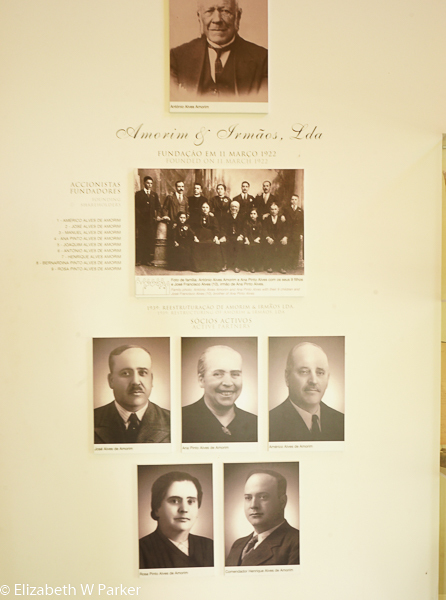 Amorim is still a family business, now in the 4th generation! Around 5:00 pm we left Porto on the ship, our first sailing. The riverboat is not allowed to navigate at night, as I said before, so we sailed until about 8:00 pm and then docked for the night at Bitetos. 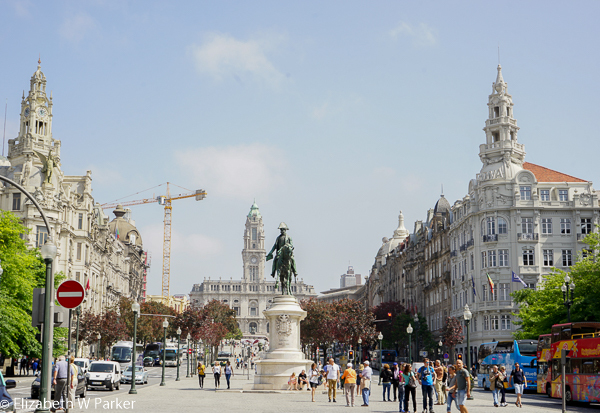 To read about our second stay in Porto, at the end of the cruise, click here. 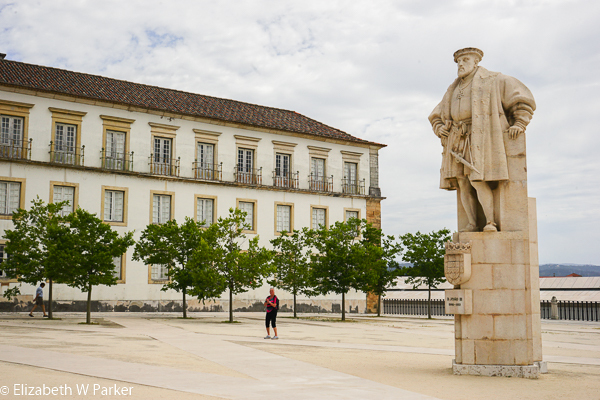 To follow the journal in order, the next part details our sailing up the Douro, click here.